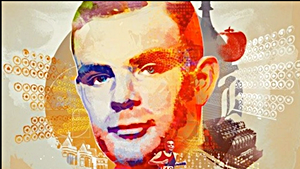 Alan Turing, a British code-breaker during World War II who’s skills and mathematics genius helped lead allied forces to victory over Germany has received a royal pardon nearly 60 years after he committed suicide because of his criminal persecution and the chemical castration he was forced to suffer because of being gay by the country of England in the 1950’s. Turing developed the Bombe, a code-breaking machine that deciphered messages encoded by German machines. His work helped change the course of the war and save thousands of lives but when his homosexuality became known he was arrested and convicted of homosexual activity, which was illegal at the time and was forces to make a decision between being chemically castrated or prison time. Two years after the castration in 1954 Turing chose ended his life at the age of 41 by eating an apple laced with cyanide. Supporters have long campaigned for Turing to receive greater recognition for his work and official acknowledgment that his punishment was wrong. The pardon, under the Royal Prerogative of Mercy, goes into effect Tuesday. .
FRC’s Tony “Chicken Little” Perkins: It’s The ENDA The World!